NOTE: this page is different from the similarly named "ssfw_004.htm"
This page describes The "Fork for 7NC kitchen" fork of FW004, "Far Watch Watcher". "Far Watch Watcher" is a utility which increases the benefit you get if you have set up an Arduserver... which can cost as little as $16... or have a FarWatch webserver. FW004_kitfork isn't typical of the software I offer via the web. It is crude. It isn't as flexible as I would like. But it does work... in a narrow context... if you are willing to get past the setting up. And it is free! OR, you can use FW004 with a webserver of your own, as long as it contains one essential lines. Material in boxes like the following is not central to the story here. It is intended to be helpful... but may cover detail you don't need. To set up a suitable webserver easily, use an ESP8266... The code you need is downloadable from my essay on another Arduserver... this time with an ESP8266. Below, you see one of the windows from a running instance of FarWatchWatcher- the subject of this page. The application you can download, free, from this page. It harvest data from the webserver, records it to a data file, and presents the data on a graph. New data joins the graph at the right hand edge, and older data is slowly "pushed" to the left. for "s": either a "+" or a "-"
The digits will be treated as reporting a temperature in DECI-degrees, C.
Except for the last character in the data line, the rest are ignored. Little bonus: You saw the "b" at the end of the line. If that is 0 (zero) a line at the bottom of the FarWatchWatcher graph is low. If it is anything else, the line is high. "b" for Binary. It is meant for reporting the state of a digital input to the server that is serving up the temperatures. "0" and "1" would be logical values. but in fact anything other than "0" is as good as "1". ... on it, so much the better. (Not used at the moment... but will be helpful to future versions of FarWatchWatcher. FarWatchWATCHER FW004_kitfork automatically harvests some of the data the server offers. It draws a graph of the readings. It even records them in a spreadsheet- friendly data file. I do offer a much better page than this, discussing the general FarWatchWatcher concept, and giving links to various related pages. I may not, in the time I've been able to give this, been able to explain things adequately, but at least I've got the code online for you. Start by seeing if you can get this FW004 to read my humidity and temperature sensor (URL is here somewhere). If you get that far, and have some ESP8266 experience (or get it, from my article, cited here too), try setting up your own sensor reading webserver for FW004 to read? If you succeed, I would be delighted to know that my work wasn't a waste of time. Apologies for not making this easier for you, the way I hope most of my pages make them easy. You can download a zip file containing FW004, the "kitfork" fork. The program is under development just now. It will read, graph and record two temperatures, though. (Plus the state of an "on"/"off", or other digital datum.) Don't hesitate to get in touch, should you have questions. Alternatively.. or in addition!... you can download a zip file containing FW004, the "05 Mar 19" fork. The program isn't a "finished product"... but it works!!. It will read, graph and record two temperatures, though. Plus the state of an "on"/"off", or other digital datum. AND: It will generate a graph of two temperatures, the state of the digital bit, and the second of the "hhhh" data. (It records both hhhh data to the data file.) Don't hesitate to get in touch, should you have questions. The "kitfork" (older) version is more carefully "properly" written up. But it is a little awkward to set up. Not impossible. Just not "user friendly". And its functions are less extensive. ... and you've told FW004 to save to that folder, using that filename (both are interactively set), then anyone accessing the webpage will see the (datestamped) graph, as it appeared on your PC the last time it scrolled. Brave? I'd start with the latest version. The rest of the text here needs tweaking to be exactly right for that, but the differences won't matter much, I don't think. A "tortoise", not a "hare"? By all means start with "kitfork"... the "upgrade" to the better one, should you want the saving of the image, wouldn't be a Big Deal. Set up a folder for FW004. You can have multiple folders for multiple copies of FW004 and its associated files, if you anticipate monitoring more than one data server. The folder name can be whatever you wish. I have two data servers. One in the garden, one watching the house's heating. My folders? "FW004-garden", "FW004-heating". Not hard. All of FW004 tries to KISS. In ver19305, there's a field you can put "Garden" or "Heating" or anything you want in. Eventually what is there will appear in all the places it would be helpful. It is already part of the jpg the application saves. This folder must be one to which whatever user is going to run the .exe is allowed to write. It is easy to set Windows to run the program when it boots. Fetch the .zip file I provide, and unpack from it to the folder you created at least FW004.exe. (That maybe all that is in the .zip) (Note that the "kit fork" part does NOT appear there. The title bar of the main window shows "Fork... for NC 8266". (No mention of "kitchen". Sorry!) Don't Try To Run It Yet. It won't run happily directly from the .zip. Now try to run FW004.exe, and it should create a FW004ini.txt. It may not run well the first time you try to use it. The application can't write to the folder it is in. One thing you DO have to edit the old fashioned way still is the WhereFmtCodeLineIs line. But if you are using the Arduserver this is designed for, that will already be right! Put anything you like in the "Free text..." box. In the separate box to the right of the box for the filename, only ".jpg" makes sense. We'll come back to the filename in a moment. The separate box determines the extension for the file. It also supplies the necessary "." You can put what you like... if it starts with a ". ", but the file will still be saved as a JPEG. Sorry. 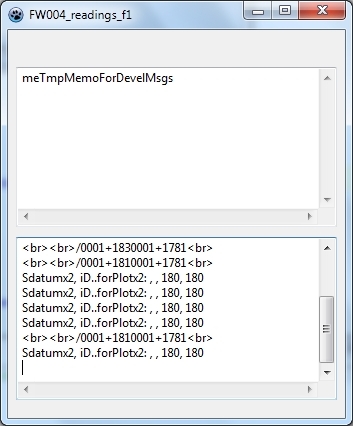 If you used "tmp" or "frmFW004", the file would be saved in the folder the .exe is in. If the .exe was running under Windows user "Fred", then the "C:\users..." filename would save the .jpg in Fred's documents, with the name "NamedWithPath.jpg"
Note that when you use the long version, technically you are supplying the PATH + filename. And that the name+path ends with the last character of the name. Not a "." Not a "/"
If you aren't using the dataserver this was written for, you may need to open FW004ini.txt in a text editor. Close the program, if it is running. ...don't matter! at the moment. You can leave the .ini file open in your text editor the whole time... but each time you quit FW004, the ini file is re-saved... with the values then present in the application. Quit FW004 BEFORE making changes to what you see in the ini file. THEN (re)save the ini file from the text editor. That way, when you next start FW004, what it sees in the ini file will be in step with what is on the screen in the text editor. See which line that is, counting the first line as "1". THAT's the number to put in FW004ini.txt as "WhereFmtCodeLineIs". FW004 should start running, returning the values from the server. When FW004 is started, it should return values from the server. You can click "Tick for debug speed..." to speed the fetch/report cycle up for testing purposes. So... you have, at least in theory, access to a webpage serving up the data in the right format. Now FW004 should Just Work! Your anti-malware software may need to be told to let the program "do" TCP to and from the Arduserver. It probably SHOULD ask if the activity is sanctioned by you! All that in place! Great! In due course, a graph of the temperature values from the server will build. (And there will be the "on/off" data in the lime-green line at the bottom of the graph. (In the graph above, the state of that datum from the server doesn't change during the period plotted. (Which was about 32 hours. It started just after midnight on day one, passed midnight once (magenta line), and ran for about another 8 hours before the screenshot was captured. There were two temperature sensors in different parts of one room. The outside air temperature was low. The room had a thermostatically controlled electric heater, which switched on about a dozen times. The big spike at about 2pm came from a door opening briefly to a very warm large room adjacent to the small room the sensors were in. The temperatures were generally between 60 degrees (troughs of green line) to 76 degrees (peaks of blue lines). Note the vertical lines on the graph. The magenta ones are done at midnight... on the machine that FW004 is running on. The gray ones are done at 6am, noon, and 9pm. The following is "exactly" right for ver19305, and broadly right for version kitfork. The image to the left is of the main control panel for the application. The wide, scrollable pane across the bottom has the html sent by the server in its raw form, i.e. as it arrived from the server. The left hand pane above that shows how the data was interpreted, and sent to the data file on the disk. Again, the following is "exactly" right for ver19305, and broadly right for version kitfork. the line from the server which came before the data. In version kitfork, there are some "Sdatum" lines. They were a Bad Idea, and not worth explaining! The top memo on FW004_readings_f1 may have ERROR MESSAGES and warnings in it. They don't "announce" themselves with beeps or flashing lights or modal dialog boxes. If your installation isn't working, have a look for messages in the top memo! I headed this "Quis custodiet ipsos custodes?"? The link will take you to the Wikipedia entry. Please remember disclaimers at top... neither the software nor the webpage meet my usual standards for customer care... but if they are useful, I am pleased to share them. If the software is useful to you, I would be very grateful for any publicity you can generate for this page. Mention it in IoT forums? On social media? Etc?. Failing that, at least a quick email telling me where (broadly... not your street number!) you are using it, and what you are monitoring, would be interesting to me. Do of course "complain" about any rough edges that were a nuisance to you... so I can try to get rid of them for the next person! Click here to visit editor's Sheepdog Software freeware, shareware page.